I have been using text expander programs for years and now I cannot imagine working on computers without such assistants. I had been using TyperTask for years- an extremely tiny and elegant text automation tool, but it was abandoned (it cannot be downloaded from the publisher's website any more) and it didn't support Unicode. Then I switched to PhraseExpress which is a powerful and well-designed program but the free version is limited. Also I was locked in version 11 because of GUI changes I found abominable (in short, the ribbon has stricken again). I also tried Lintalist which is a nice tool but for me it is not easy to configure. So I was searching for an alternative and some time ago I found a program which completely satisfies my text automation needs- it is free and open source, it is portable (from version 0.11), it supports Unicode, it is in active development- in one word- this is Beeftext. 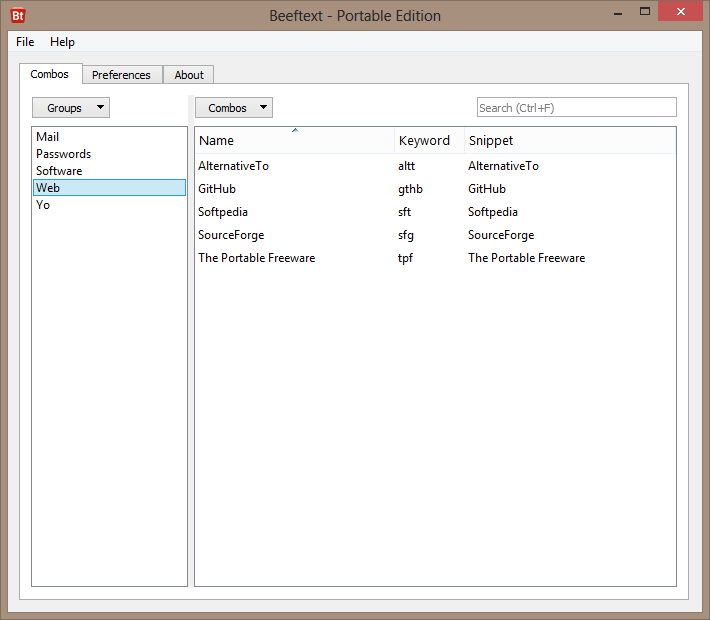 Beeftext is a text snippet management tool for Windows, inspired by TextExpander. TextExpander is a great program, packed with features. To to keep the company profitable, Smile had to switch to a subscription-based model in 2016. And for people who only need the basic features of TextExpander, the monthly price is way too high. 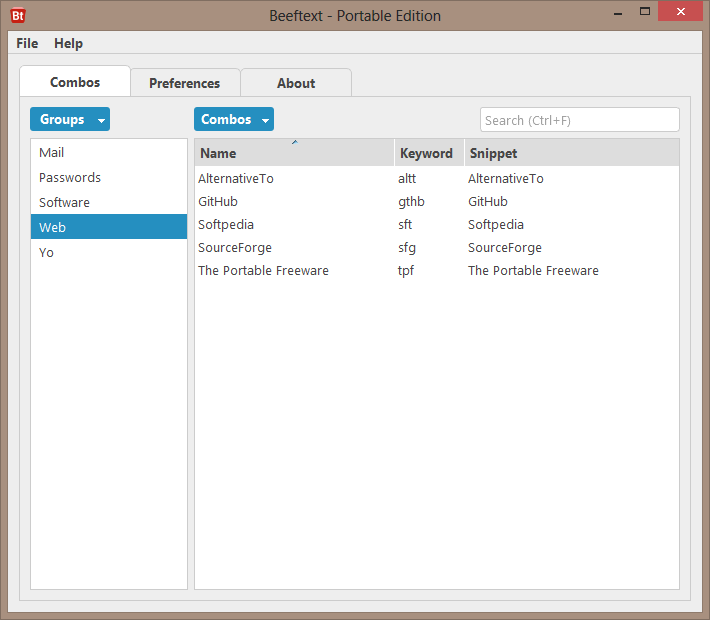 Beeftext aims to be the best possible alternative to TextExpander. Beeftext is an open-source project written in C++ using the Qt framework. 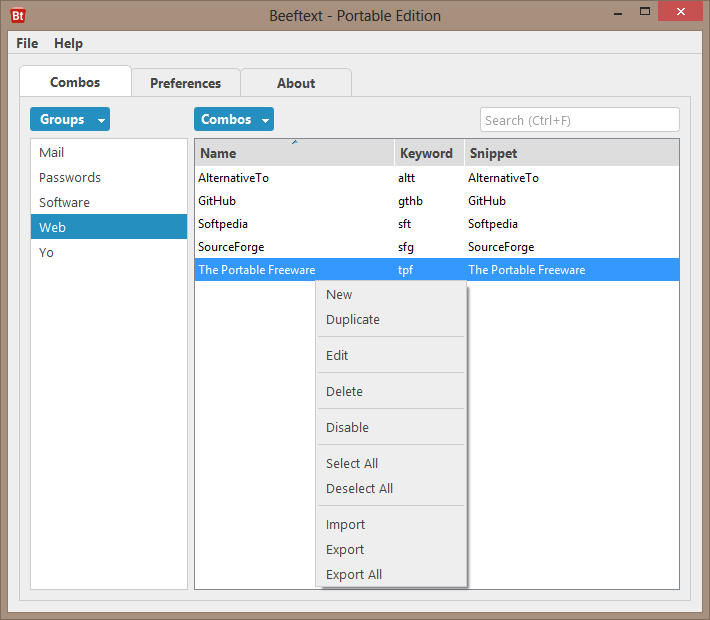 As mentioned above since version 0.11 Beeftext comes with a native portable version. Data and settings are saved in Data sub-folder (which contains Backup sub-folder and Settings.ini, comboList.json, log.txt files). 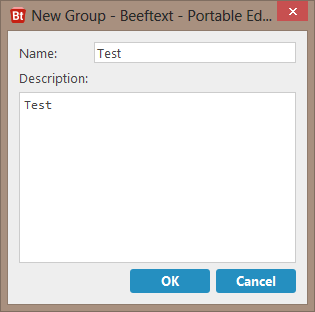 Beeftext runs on Windows 7 and newer. 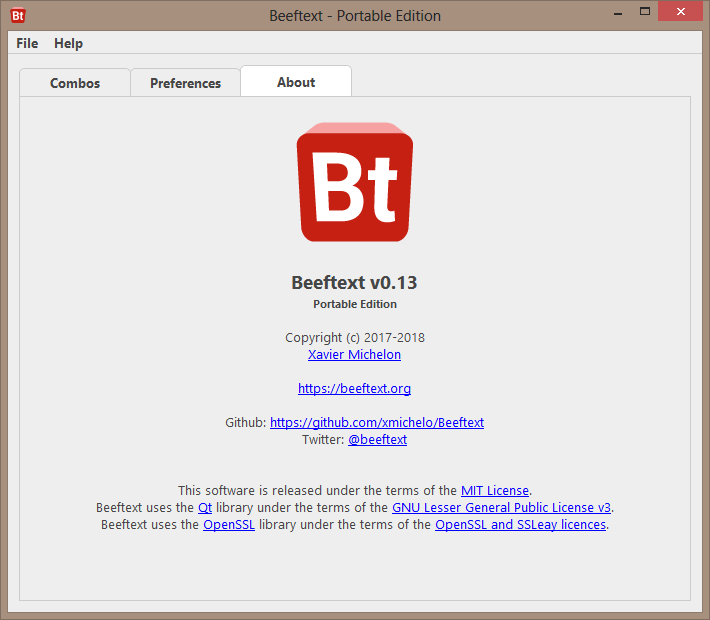 Beeftext is released under MIT License. 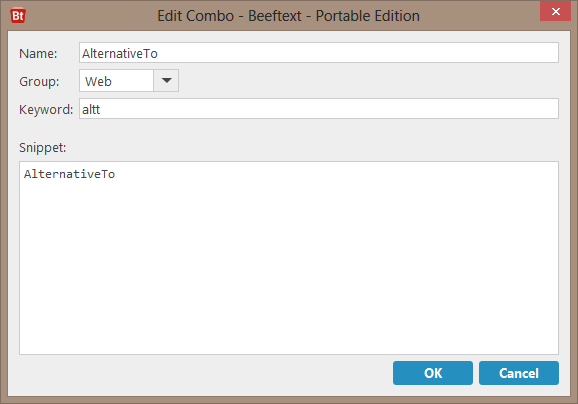 I would like to thank again the developer- Xavier Michelon, for accepting my request for portable version of Beeftext, for his helpfulness and for his work on the program. Although Beeftext is very stable the developer has chosen to label every version prior to version 1.0 as pre-release. On my Windows 8 x64 system Beeftext uses a moderate amount of memory- about 33 MB of RAM. 1. How to create the perfect Forum entry! 2. Can I say welcome back! 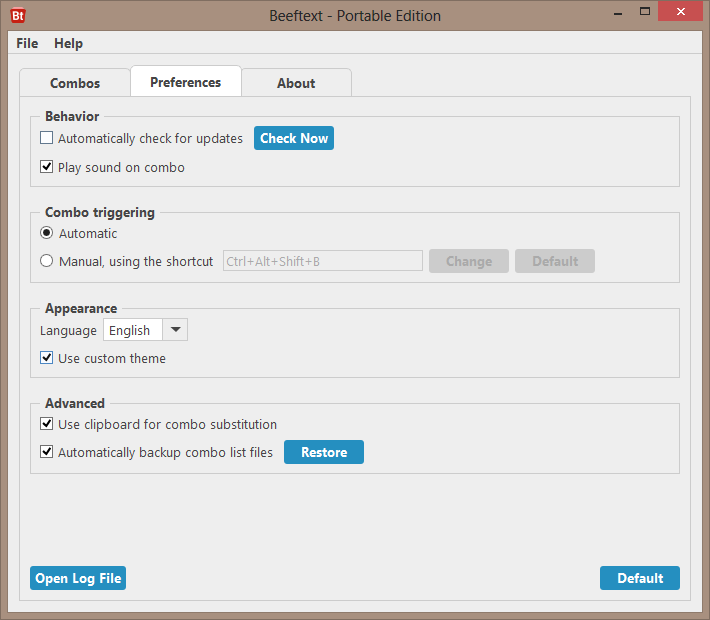 This is the first stable release of Beeftext. The automatic updater displays a more friendly name when the user has UAC enabled. Fixed an display issue when enabling/disabled custom appearance. Fixed the tab order in the new/edit combo dialog. Added application information in the RC file. Fixed an issue with the translation of the default combo group. Excellent, great add. I'll try to test this out soon. Improved support for applications that do not support Ctrl+V for pasting. 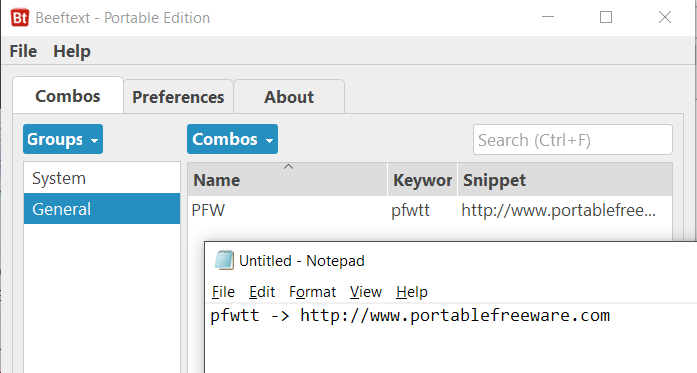 I've had Texter (https://www.portablefreeware.com/index.php?id=1212) on my machine for years but strangely something about pressing <Enter>, <Tab> or another key to trigger a keyword just never really worked in my head. For whatever reason, Beeftext's automatic and almost instant jump from keyword to full text makes so much more sense. It's one of those things I'd have never judged correctly, except by using the tool. I’ve always thought about programming a tool that would support me in not typing the same text phrases over and over again. But now, with Beeftext there is no need to do this. Beeftext is a tool that - at least for me - works just as expected, which is great. One thing to mention is that Beeftext reads all the text you type on your keyboard as it looks for defined keywords which it then will replace. That means it also reads your passwords when you log in somewhere. But to me the developer seems trustworthy - I couldn’t find anything suspicious after taking a (quick) look at the source code. So for me, this is not a problem. Thanks to Xavier and smaragdus! I added Beeftext to the database. Excellent thanks. I did a bit of wordsmithing to the entry but it was already great. Kudos on the APNG program slideshow.